Filmmaker Larry Adelman and offers a powerful argument that a zip code is a better predictor of health outcomes than genetic code, diet and even medical care. 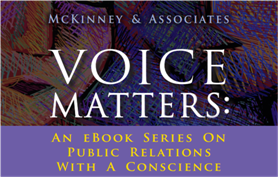 Adelman, the creator of Unnatural Causes: Is Inequality Making Us Sick?, kicks off the first edition of the Voice Matters eBooks series with a call to arms for health equity in the world’s richest nation. The series benefited from the contributions of some of the country’s leading health equity researchers, practitioners and advocates. We have pulled together a list of contributors who would be great resources for bringing additional expertise to your screening, panel, or other event. Feel free to use and adjust this invitation template (in doc format) to meet the needs of your event, or download the logo and create your own. This two-sided flyer introduces the series along with the tools and resources available on the companion Web site. Be sure to download both sides! The series graphic in a 1.2MB jpg file. Clicking on the link will open the image in a new window. To download, right-click (on a PC) or hold control while clicking (on a Mac) and "Save target as..." or "Save link as..."
The series graphic in a 2.3MB tif file. For use on large or high quality printing. The series graphic in a 151KB jpg file, for general use on low-resolution printed documents.